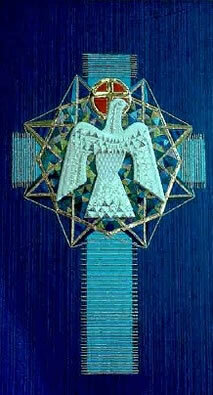 A dove embroidered in white and silver flies out of and over a gold crown of thorns set against a mosaic of harmonic colours. The square shape represents the Holy Spirit and the vertical white lines the light which blinded Saul on the Road to Damascus. The thirteen rectangular shapes at the base spell out in runes the words "Who Are You Lord?"